Some popular bloggers just came back from a trip sponsored by yet another brand that uses labor in emerging nations to make millennial fashion. This business is different in that it’s mission is to empower women in those countries. It’s a non profit that’s run by people who seem to be pretty devout Christians but the business itself doesn’t appear to be as missionary in nature as others have been. The bloggers who took the international trip are very popular so there’s been much criticism of the trip and naturally that criticism has been almost exclusively done in private forums. The criticisms begin with their inappropriate clothes, the fact that the bloggers are too fat or too skinny, that their hair is just plain awful and that their diet needs are insulting to the local people. This first batch of criticisms are ridiculous. The bloggers are pretty and young and that makes them easy to hate. No one is too fat or too thin, they get expensive things and their hair is just fine. This is easily written off as envy. I’ve thought about naming the bloggers and the project but I don’t think it’s entirely bad (I don’t think it’s entirely good) and I have no interest in undermining the work they’ve done. Also, it’s not a particularly unique trip or dilemma so perhaps the ubiquity of the junket will serve to spur more thoughtful discussion that ought to be had in any event. Now for the valid criticisms. People are saying there’s more than a whiff of colonialism and white savior complex with these overseas non profit businesses. People are right to note this. It’s odd when folks go to Africa on safari and come back wanting to save the continent. Part of my teenage soundtrack was the song Do They Know It’s Christmas, it was an insanely popular and raised money for African Famine Relief, certainly a noble cause but at the same moment tone deaf. Who cares if people in Africa know that it’s Christmas time? Not all Africans are Christians, though to be fair a great number are. With that same sense of disconnect people are labeling many of these trips, the whole business model as poverty tourism. If you want to photograph poor people there are 1.6 million Americans who don’t have indoor plumbing. People also note that workers in these emerging nations are not being paid what an American worker would make and ask if this is just gussied up outsourcing? That’s a fair question. Simply because something is a non profit doesn’t mean it’s not making money for someone. I’m not ready to say that these blogger trips don’t have value. I’m not hopping into discussions about exploitation, missionary work, the fact that non-profits need large marketing budgets or cultural sensitivity. Instead I want to introduce you to a non profit that is local to Los Angeles and has transformed lives and the cityscape here since the 1980’s. 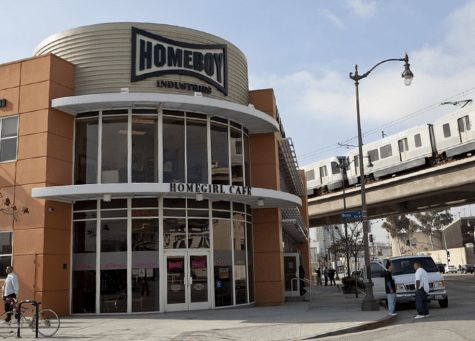 Homeboy Industries started in Boyle Heights which is just east of downtown. Unless you have a friend who lives there, a gang affiliation or a sudden need to buy used tires it’s unlikely you’ve gotten out of your car in Boyle Heights. You’ve probably driven through as it’s bisected by the 5 freeway. Before my childhood Boyle Heights was actually a middle class Jewish neighborhood. My first college roommate was from Boyle Heights, she was Latina and the poorest person I’d ever met. Visiting her home the same year that Homeboy Industries began with some screen printing changed my lens. By the 1980’s Boyle Heights was a dangerous place to live and there was a priest here in town, Father Greg Boyle, who rightly noted that by giving jobs to young men who were trying to leave gangs there was structure to their days and a support system that reduced recidivism was created. I remember their early tee shirts and the failed graffiti removal business. Homeboy industries currently provides jobs, job training, education, therapy, legal aid, tattoo removal and more for the men and women they serve. Homegirl Cafe is a spectacular place to grab lunch downtown, the service can be a little spotty but when your server is leaving gang life and just doing her best it’s easy to be patient and to cheer wildly when they get it right (which is usually the case). The food has been consistently delicious. Currently you can buy Homeboy Industries chips and salsa in Ralph’s grocery stores (it’s our local Kroger). If you buy tortilla chips there’s no reason to buy anything else, they’re no more expensive than the mass produced chips, you know they’re local, they happen to be delicious and you’re spending money with a company that is taking men and women (and their children) out of gang life and helping settle them into a more typical existence with a career and a family a positive impact on our community. Nothing needs to be imported. 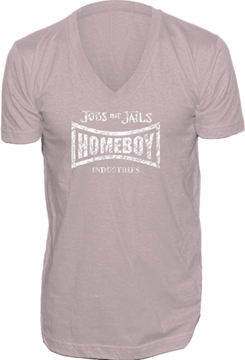 You can shop Homeboy Industries from anywhere. They have books and tee shirts, bags and a Bundt Cake that makes an amazing and reasonably priced gift. I’m not sharing Homeboy Industries with you because they’ve reached out to me or because I think you need more cake (you probably do). I’m sharing this because I’ve been critical of cause marketing, because I’ve decided that the only charities I will personally support are the ones who have an impact on girls and women in America or on the population of Los Angeles. I’m sharing Homeboy Industries with you because they’ve undeniably taken blight and turned it to business. They serve the community by providing jobs and also by providing great food and fun clothes. They provide soft and hard job skills, an exit from gang life and save the city and state tens of millions of dollars. I’m sharing Homeboy Industries with you because it’s unlikely that you have to leave your hometown to find a business that deserves recognition. I’m sharing Homeboy Industries with you because shopping in your own back yard can be a lot of fun. Is every non profit 100% good? Probably not. There are sometimes unintended consequences of altruistic actions (like the graffiti removal men being killed) and sometimes you’ll find a non profit that simply does not align with your own values. It’s important to think critically when you’re deciding who to support. I want to ask something of you who are critical of the poverty tourism junkets. I challenge you to find and highlight someone or some organization who is making a positive impact in your own back yard. There are thousands of them right here in Los Angeles. I promise you that there’s someone doing something magnificent in your home town. Thoughtful article. I have to roll my ideas at the thought of people complaining about other people helping. Who cares who they are helping, as long as they are helping people? The bigger complainers always makes me want to dive into their own charitable efforts… but I’m crabby this morning so maybe that’s why. Thanks for posting about this group though, they look fantastic. I have some similar ones in Orange County that I’ve worked with before.